Say hello to my new best friend. I am so in love with this right now. I read a couple of reviews on this recently, and you know what it's like, you kinda think they're too good to be true. People were raving about it and saying how it seemed to iron out their skin overnight! We took a trip to London, a good few weeks ago now, and we were browsing in Liberty, as you do, when we happened upon the skin care and cosmetics department, how did that happen? Well, I spied the Kiehl's counter at the other end of the store and was strangely drawn. Whilst I chatted to the lovely young lady about the sorry state of my skin, Mr C was browsing round the make up and nail polishes!!!! I know you may think him weird, he's not, he's just got great taste in make up and, wait for it, ladies clothes. No, not in some weird way, like you're thinking, but he can spot a nice outfit for me at 50 yards. He calls himself my Gok Wan! Aren't I one lucky lady. He also knows all about my skin care routine and all the products that I use, maybe that has something to do with the fact I make him sit through all the Elemis TSV's on QVC. He's fantastically knowledgeable!!! Anyway, I digress, back to the issue at hand, my distressed skin! I took the plunge and bought the little blue bottle and it was nicely packaged in the little purple bag! I know some people are very wary of putting any type of oil on to their skin, that thought of waking with an oil slick all over your face is just so frightening, but trust me it does not happen. I've had spotty combination skin all my damn life and even now I still have regular breakouts, but I've used a few oils now and been happy with them, but only 'happy'. I wanted one to really impress me. Although my skin is combination I'm finding it rather tight and dry at the moment too thanks to the central heating or fire being on constantly! You only need two or three drops of the Midnight Recovery Concentrate for it to work it's magic, although I currently use four drops to help with my dehydration. I feel like a pharmacist with the glass bottle and the pipette dispenser!!! That's how Kiehl's started out you know, as a community pharmacy. When I put it on my skin just drinks it straight in, it doesn't feel oily or greasy to the touch at all, it feels smooth and soft instantly. It smells divine too, which is mega important to me. It's got lavender in it, which is just blissful when going to the land of nod, not so blissful if you're not a fan or lavender. It's not too strong though so go have a sniff first before you purchase. If you can't try before you buy, please don't worry as I'm happy to accept anyone's cast offs! This divine oil works it magic overnight whilst you are busy dreaming about all sorts of lovely things. When I wake in the morning my skin looks all refreshed and replenished and it's really helping with my dry skin. It's not the cheapest facial oil on the market, at around £36 a bottle, but I'm happy to pay that as it works for me, and I know it will last a good few months. This little blue glass bottle of essential oils will be a constant on my bedside table and will travel everywhere with me. I was kindly given a sample of their Midnight Recovery Eye Cream too. Bless her, she obviously took one look at my eyes and knew they needed help. She's not wrong. I have used the whole tube of the eye cream to get a good idea of it, but sadly have to say it's not for me. The delicate skin around my eyes is very dehydrated (due to strong medication for years I feel) and it needs more that this cream can give. I'm still on the hunt for the miracle product for my eyes. If you find it don't forget to let me in on the secret too! Are you a Kiehls fan? Have you tried the Midnight Recovery? Well, I finally made time to nip off to get me some of this recommended product, unfortunately I didn't have time to go to the new Kiehl's shop so popped into Selfridge's as it is nearer to my office. 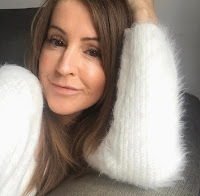 I tried it for the first time last night and WOW, you are quite right Mrs Canham, fabulous stuff, my face felt great this morning, instead of feeling like wrinkled sandpaper like it normally does. I congratulate you on your recommendation. At the same time of buying this I did find some body moisturiser as I have ridiculously dry and sensitive skin. Like the Recovery Concentrate it was quite expensive but again, fabulous stuff, my legs still felt nice and moisturised this morning and as it is perfume and colour free, my skin did not feel irritated so well done Steph, a cracking find.